With Earth Day on the horizon and April's designation as Earth Month, the next few weeks mark the time when people are thinking about their own roles in helping the environment. Here at Iron Horse we are planning our Celebrate Earth Day in Green Valley event to take place Sunday April 19 – Green Valley being our special growing area in western Sonoma County. This year commemorates the 45th anniversary of Earth Day. It started as a protest and has evolved into a global celebration. Where better to celebrate than Green Valley when the vineyards are pushing out, Sebastopol’s Gravenstein apples are in bloom and Deloach Vineyards, Dutton-Goldfield Winery, Freeman Vineyard & Winery, Hartford Family Winery, Iron Horse Vineyards, Lynmar Estate, Marimar Estate, MacPhail Family Wines and The Rubin Family of Wines are showing new spring releases. We started our event in 2007, when we came up with the tag line: “Eat, Drink and Be Green”. Once we put green and Green Valley together, there was no looking back. The wines are of course delicious; the food a locavore’s feast. There’s live music, an art show and a high tech element. Last year it was a demonstration of aerial drones adapted for agriculture. Before that, 3-D printers churning out wine glass charms on demand. Past speakers include Supreme Court Justice Sandra Day O’Connor, Gils Grosvenor, Chairman Emeritus of National Geographic, Ted Turner and Jared Diamond, the Pulitzer Prize winning scientist who wrote Guns Germs and Steel. National Geographic became involved in our Earth Day event on year two thanks to a very special friendship that my mother struck up with Gil Grosvenor, when they were tablemates at an event at the Field Museum in Chicago, and found out that they share the same birthday – both the day and the year. Out of that personal connection, the relationship grew into a partnership in creating Iron Horse Ocean Reserve Blanc de Blancs. We produce about 1,000 cases a year, depending on the vintage. $4 a bottle goes to National Geographic’s Ocean Initiative to help establish marine protected areas and support sustainable fishing around the globe. We picked the ocean as our cause because the Pacific is the driver of our special micro-climate that allows us to produce bubblies on such a great level of finesse and quality, so the health of the ocean is key and this special cuvee is one way that we give back. 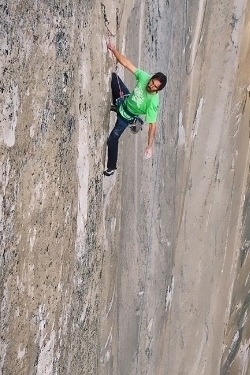 It was an incredible thrill that Kevin Jorgeson and Tommy Caldwell, hands shredded from the sharp granite, celebrated on the summit of El Capitan with Ocean Reserve. The bottles were carried to the top by friends and family of the climbers in backpacks and using ropes. The photographs broadcast around the world. It is a pleasure to toast something so positive and inspiring. Tickets for Celebrate Earth Day in Green Valley are available on the Iron Horse website; www.ironhorsevineyards.com. Net proceeds will benefit The B-Rad Foundation, a memorial fund set up for the late Sebastopol rock climber Brad Parker, supporting community, getting kids outdoors and environmental stewardship.